GSM Subscriber Additions Down Again In November, Has Growth Peaked? Growth is floundering again in the mobile services industry with the new net additions to total GSM subscriber base falling sequentially once again in November after turning tide for the two previous months, according to data released by industry body COAI. 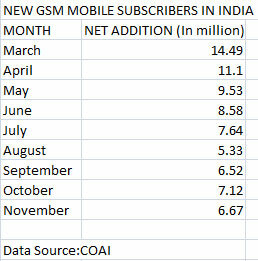 A total of 6.67 million new GSM subscribers were added last month compared to net addition of 7.12 million in October. This marks a reversal of the recent trend as the number of net additions that had seen a sharp slowdown early this year, had bounced back in September and October. For six months (beginning March) the new net additions to total GSM subscriber base was falling sequentially each month (see table). This changed in the month of September which saw net addition of 6.52 million users as against 5.33 million in August. While the increment to the new user base in October was higher still, the November numbers shows slack in growth for new connections as large swaths of Indian population have got connected wirelessly. The total number of GSM subscribers reached 632 million at the end of November, covering roughly half of Indian population(not counting people with multiple connections). Private telecom operator Idea Cellular added the maximum number of subscribers in the month of November (2.17 million) followed by Uninor (1.86 million). Among the new comers Videocon saw a decline in users in November. Others like Etisalat, S Tel and Loop remain bit players in the market which shows the younger players have not made much dent in the market. The market is completely dominated by the top 5 players who account for more than 90 per cent of the total market.